The wonderful clean smell of fresh lemons. These bright clean yellow candles with their natural looking lemon peels on top are a must for every kitchen. 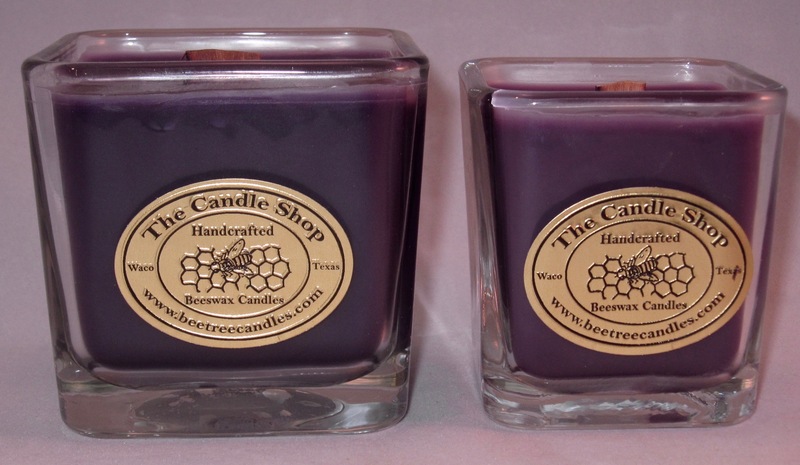 The large jar measures 3.5” square and the small jar measures 2.75″ square. 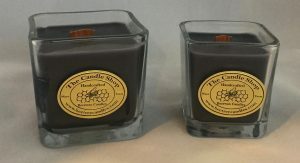 They are filled with the finest grade of natural beeswax and scented with our own special blend of pure essential oils and fine fragrance oils. We use a wooden wick that burns clean and crackles like a real open fire. The burn time for this jar is approximately 40 hours. 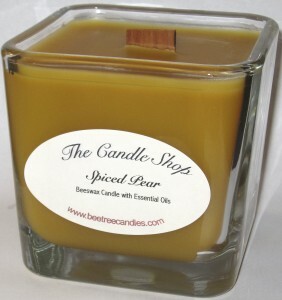 Our tan “Vanilla Chai” candles swirl with rich brown spice and warm vanilla. The large jar measures 3.5” square and the small jar measures 2.75″ square. They are filled with the finest grade of natural beeswax and scented with our own special blend of pure essential oils and fine fragrance oils. We use a wooden wick that burns clean and crackles like a real open fire. The burn time for this jar is approximately 40 hours. 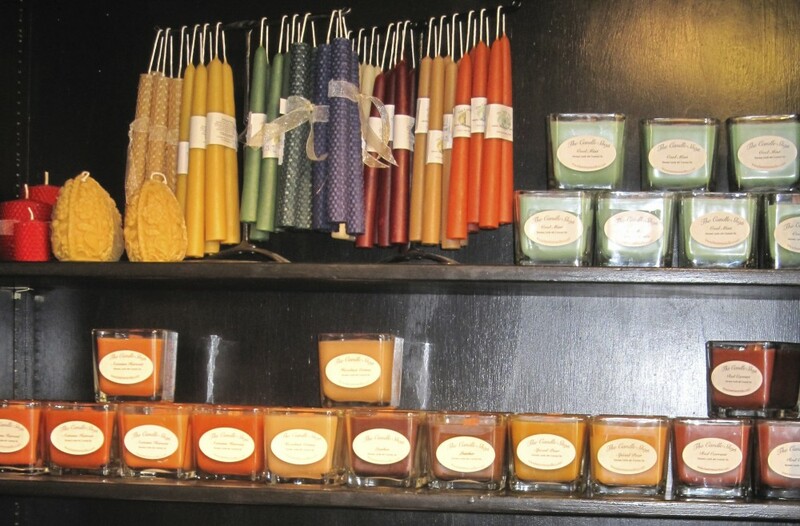 Saddle brown and the rich aroma of leather our “Leather” candles appeal to the most fastidious taste. The candles come in two sizes. 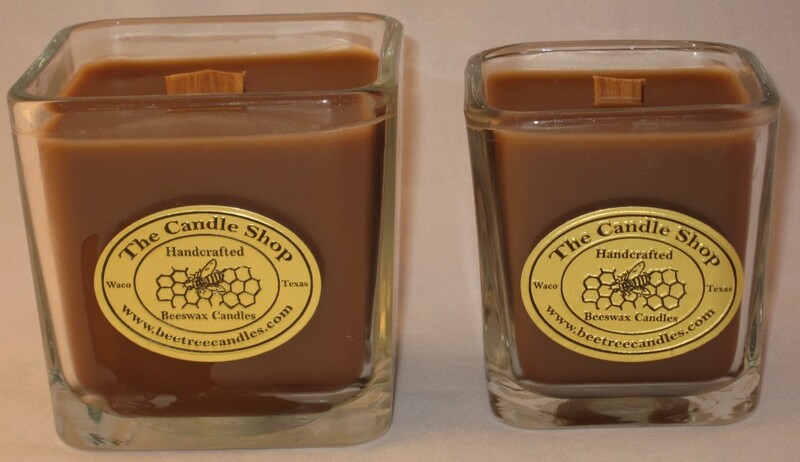 The large jar measures 3.5” square and the small jar measures 2.75″ square. These glass jars are filled with the finest grade of natural beeswax and scented with our own special blend of pure essential oils and fine fragrance oils. We use a wooden wick that burns clean and crackles like a real open fire. The burn time for these jars is approximately 40 hours. 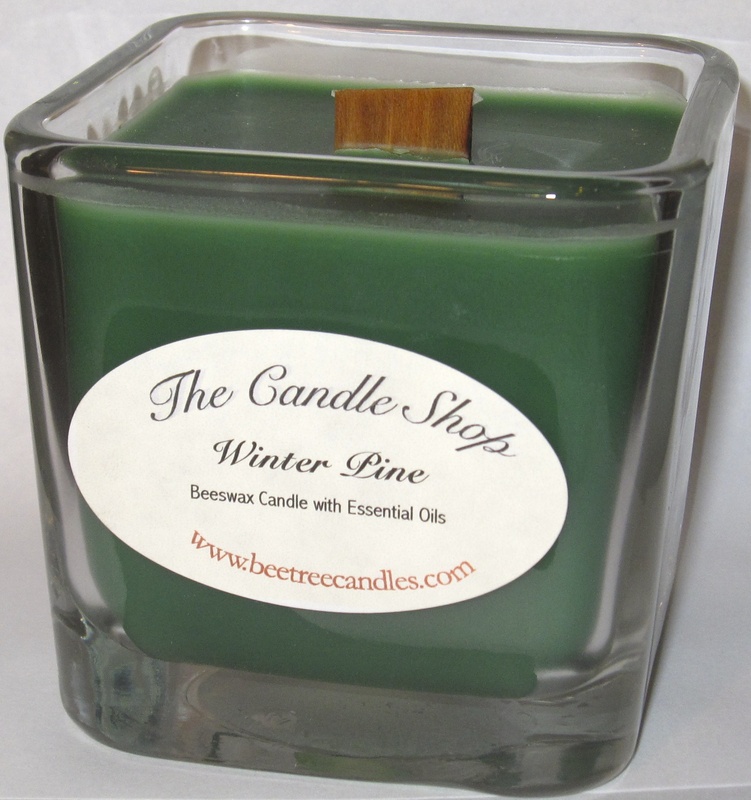 It’s a great blend of peppermint and spearmint in this green candle for a refreshing clean scent. 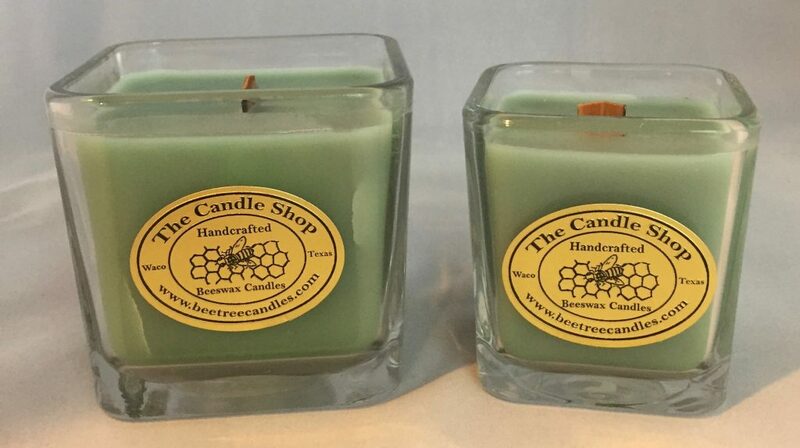 These candles come in a 3” square glass jar filled with the finest grade of natural beeswax and scented with our own special blend of pure essential oils and fine fragrance oils. We use a wooden wick that burns clean and crackles like a real open fire. The burn time for this jar is approximately 40 hours. 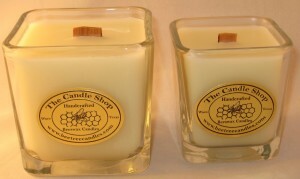 Our “Baby’s Room” is an ivory beeswax candle with the mingled scents of baby powder and floral fields. 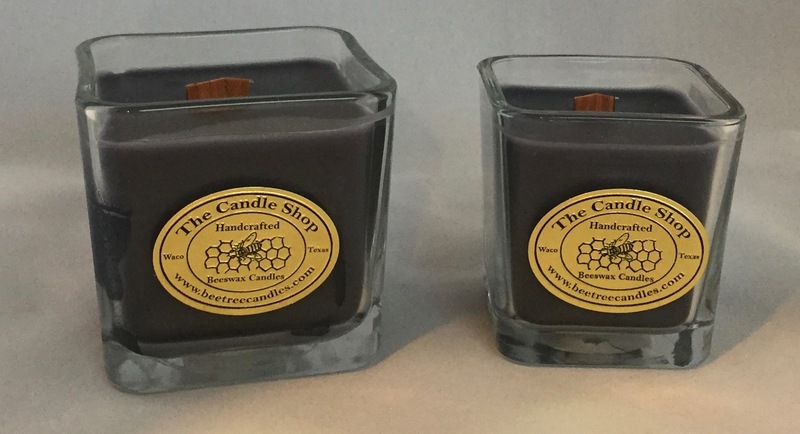 These candles come in a 3” square glass jar filled with the finest grade of natural beeswax and scented with our own special blend of pure essential oils and fine fragrance oils. 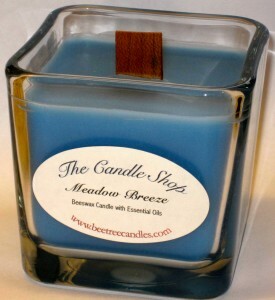 We use a wooden wick that burns clean and crackles like a real open fire. The burn time for this jar is approximately 40 hours. Midnight Sky is a black candle with a crisp, clean fragrance. 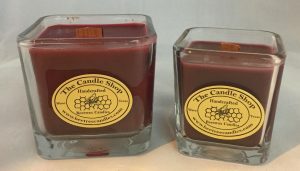 These candles come in a 3” square glass jar filled with the finest grade of natural beeswax and scented with our own special blend of pure essential oils and fine fragrance oils. We use a wooden wick that burns clean and crackles like a real open fire. The burn time for this jar is approximately 40 hours. Our Holiday Spice has a spicy festive fragrance. It is scented with 100% essential oils. 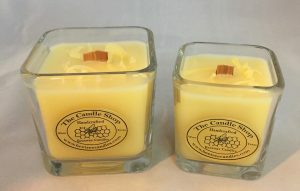 These candles come in a 3” square glass jar filled with the finest grade of natural beeswax and scented with our own special blend of pure essential oils and fine fragrance oils. We use a wooden wick that burns clean and crackles like a real open fire. The burn time for this jar is approximately 40 hours. 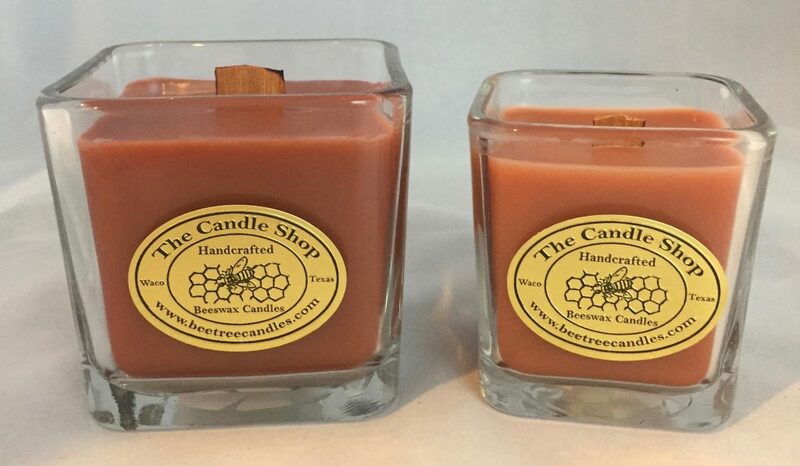 Our Candied Apple candle has the true smell of sweet apples and candy. 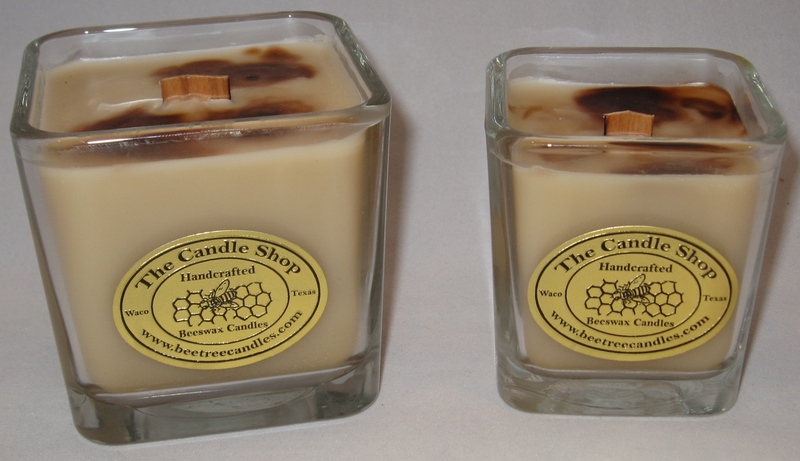 The large jar measures 3.5” square and the small jar measures 2.75″ square. 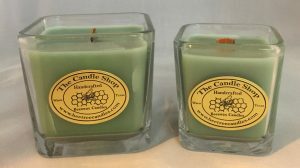 filled with the finest grade of natural beeswax and scented with our own special blend of pure essential oils and fine fragrance oils. We use a wooden wick that burns clean and crackles like a real open fire. The burn time for this jar is approximately 40 hours. 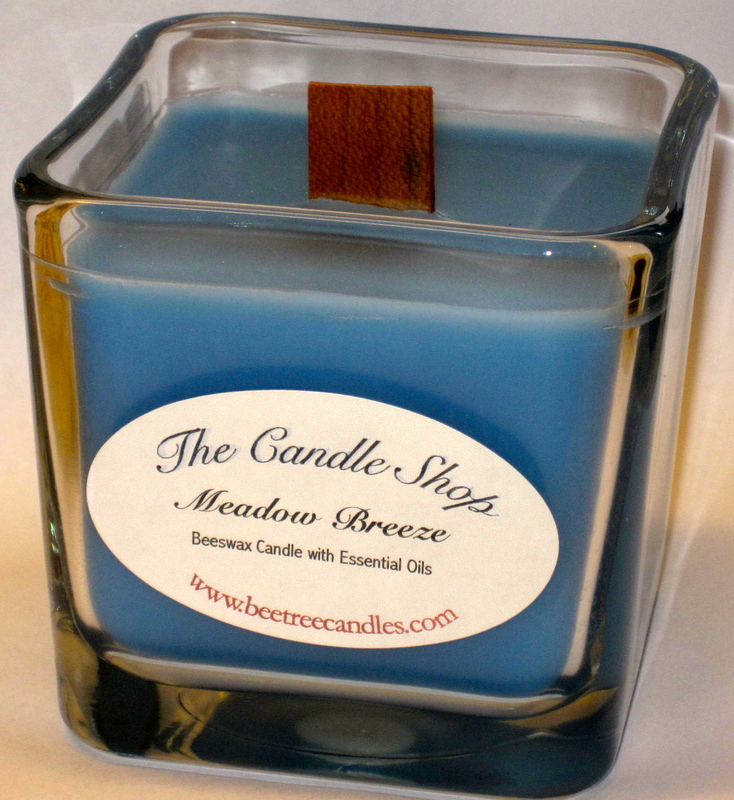 This is our unscented, all natural candle. 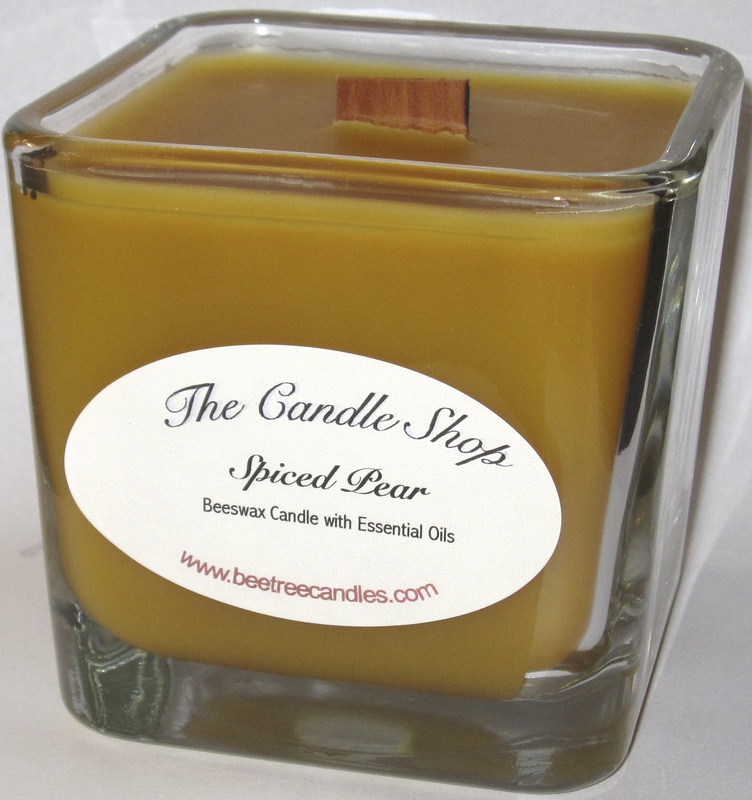 The color varies from Ivory to a deep gold, and has the soft smell of honey. This candle comes in two sizes. 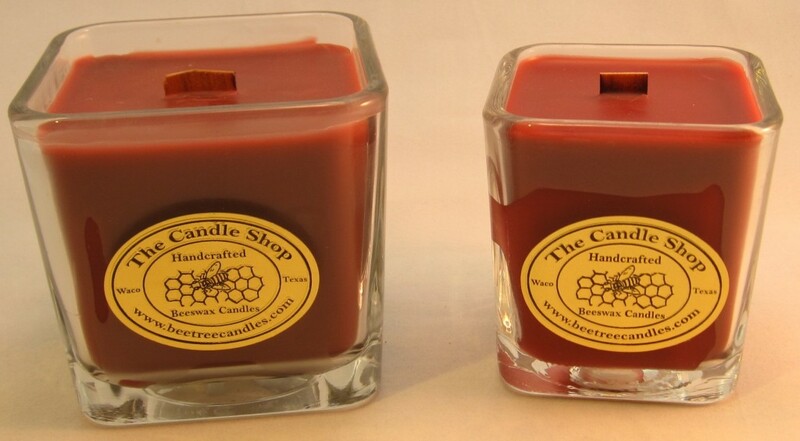 The large jar measures 3.5” square and the small jar measures 2.75″ square. 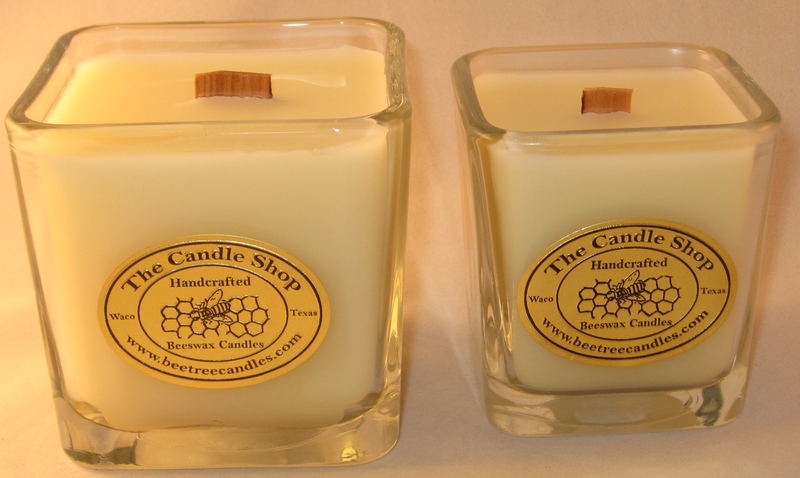 These glass jars are filled with the finest grade of natural beeswax. We use a wooden wick that burns clean and crackles like a real open fire. The burn time for these jars is approximately 40 hours. A floral bouquet reminiscent of fresh picked red rose petals, jasmine blossom, and bitter geranium. 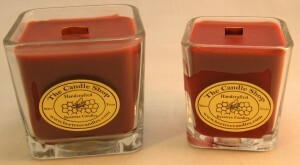 The large jar measures 3.5” square and the small jar measures 2.75″ square. They are filled with the finest grade of natural beeswax and scented with our own special blend of pure essential oils and fine fragrance oils. 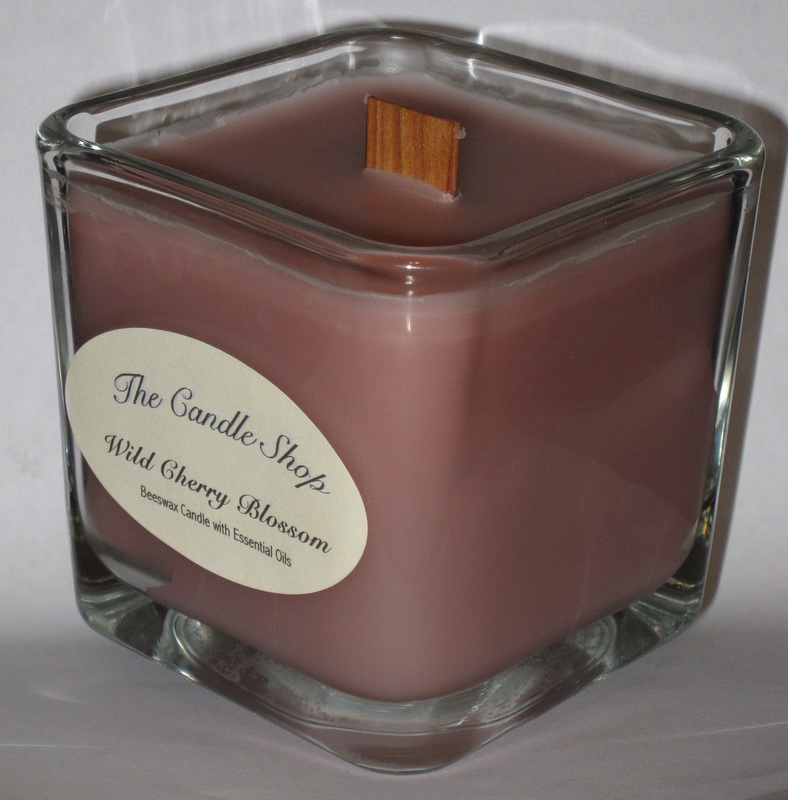 We use a wooden wick that burns clean and crackles like a real open fire. The burn time for this jar is approximately 40 hours. For all orders outside of the United States, please contact us for a shipping quote.